By the year 2020, customer experience will overtake price and quality as the key brand differentiator. In other words, brands that don’t work on improving their customer experience will be left behind. Customer experience is more than a trend or buzzword — it will play a pivotal role in the future of marketing and has an insightful ability to predict where a company will be 5-10 years down the line. What should you be doing, if anything to prepare for this change? On a basic level, customer experience (CX) refers to how a customer perceives their interactions with your company. How does your customer feel at every touchpoint they have with you, from marketing to sales to support? CX is ultimately defined by the consumer, which means businesses need to actively adapt and set themselves up to exceed expectations. Should you be investing in this? Joe Hanousek, Esker’s Customer Experience Manager, believes that every company needs to be tracking their customer touchpoints and working towards continually improving that process. He often says that: “Seventy percent of senior executives in companies believe that CX is important. In my opinion, the other 30 percent shouldn’t be executives.” So much of the B2B focus is on lead generation instead of improving customer experience, although most people are well aware that it is less expensive to keep existing customers than it is to acquire new ones. Companies mistakenly start looking into customer experience as a last resort once they’re suffering, but customer experience is best as a proactive approach, taken when business is growing versus lagging behind. 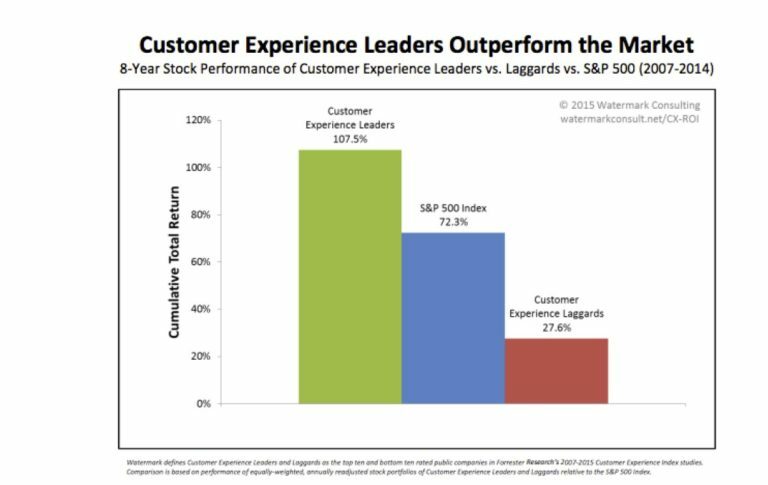 The graph below shows just how valuable an investment in improving customer experience could be. If you’re just getting ready to work on improving customer experience, aim for C-level sponsorship. It won’t go very far unless there are people at the top behind it, so do the research you need to convince someone to back you up. Most executives are aware of the importance of CX, but still aren’t taking active steps to improve upon it. If you haven’t already started in a few years, it’ll be too late. Next, be sure you’re ready to invest a significant amount of time and human resources into building a solid customer experience program. At Esker, the process took a full year to go from conception to having a Customer Experience manager and a team in place. It’s a good idea to have at least one person fully devoted to customer experience and multiple people from different departments committed to being a part of the CX improvement process; otherwise, CX can easily become a task that is swept away on an already busy to-do list. This will also depend on executive buy-in, as far as whether the need to have a customer experience manager or team is understood. Finally, it is important to communicate the goals of the customer experience program throughout the organization. Everyone should be on board and kept up to date. As Joe puts it: “It’s not C-Level people or managers that make customer experience better — it’s the staff working directly with them.” Educate, train and update all those who interact with customers at any level on what needs to be done to improve those important touchpoints. The beginning stages of our customer experience journey. Joe’s biggest recommendation for those starting to work in CX? Change your perspective. “It is not an area for problem customers to go to, but rather a way to prevent customers from ever having the problem in the first place,” he explained. As staff focus on offering solutions to immediate problems, the CX team should be looking into why those problems happened in the first place, and if there is anything that could be done to fix that. Customer experience goes beyond customer satisfaction or happiness. A successful customer experience program will work to prevent problems before they arise, delighting your clients past the point of mere satisfaction. CX has become more of a trend in the past two years, but it is definitely here to stay for the long haul. If you have any questions about the process we went through to build our customer experience program at Esker, or about customer experience in general, leave a comment below and we will respond to you!